If there is one thing RxBars has right, it is the use of simple and minimal ingredients. Earlier this week we shared about lifestyle tips that keep you on track without feeling like you are always on a diet. Well, one of those tips was to eat as many whole foods as possible. Using whole foods and pairing it with our pre-workout supplement POW, we created some each to make snack bites that will help power you through your next workout. 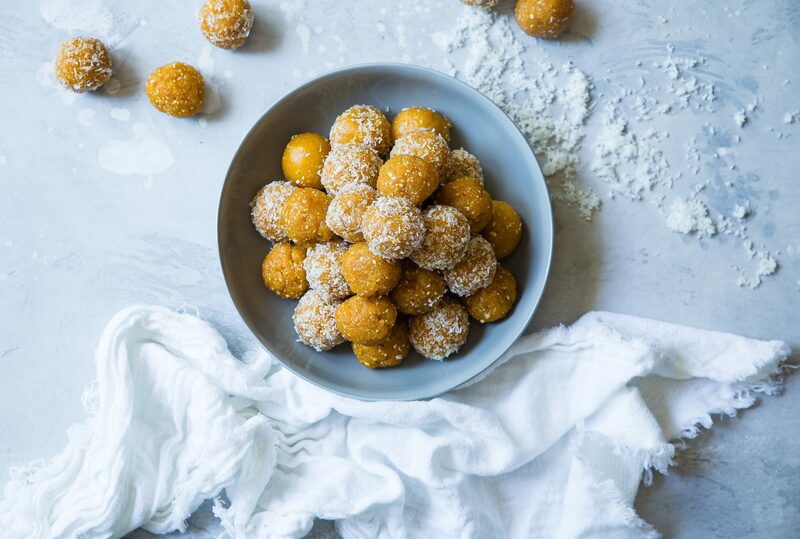 These Mango POWer balls are perfect for spring and putting a little extra pep in your workouts. Add the dried mango to a mixing bowl, cover with warm water and let soak for 5-7 minutes or until soft and pliable. Then drain water, lay mango slices on a towel, and pat off excess moisture. Add cashews to a food processor and mix into a fine meal. Add dates and the mango to the food processor and mix until a rough paste/sticky dough forms. Now add the chopped up cashews back in, along with hemp seeds, coconut, lime zest, POW and sea salt. Mix in food processor until it forms a moldable dough. If it feels too sticky or wet add more coconut or hemp seeds if it is too dry add more dates. Scoop out rounded TBS amounts and roll into little balls in the palms of your hands. Place any extra coconut you have onto a plate and roll balls into the coconut to create a coconut coating. Enjoy immediately before your next workout.